This year the Schroders London Boat Show plays host to the first indoor windsurfing championships to be held in the UK. The show runs from 8-18 January at ExCel in the heart of London’s docklands. The Indoor Windsurfing Championships sponsored by Virgin Radio and launched by the UKWA (UK windsurfing association) and the PWA (professional windsurfing association) marks the first event on the UK windsurfing calendar for 2004. 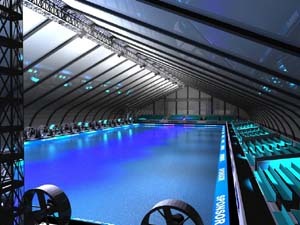 The massive 70m x 30m pool, which has been purpose built for the competition, has 25 huge fans generating 30 knots of wind. However, news has just reached us that problems filling the pool means the indoor sailing event won’t actually start until Monday 12 January. Riders will be competing in three disciplines slalom, freestyle and jumping.Two big names who will feature in the jumping and freestyle sections of the competition are top UK riders John Skye and Robbie Swift. Robbie, still only 19-years-old has been windsurfing since the age of three. Introduced to the sport by his father and named after his father’s hero windsurfing legend Robby Naish, Swift is high in the world rankings. In fact until the Bonaire World Freestyle Final in December he was ranked joint first with winner of the competition Ricardo Campello from Brazil. Bagging the title of UK National Wave Champion at the White Air competition in November made a perfect end to 2003 for John Skye, despite being hampered by injury earlier in the year. First place in the competition’s expression session secured his position as wave and freestyle champion for the event. He is very positive about the first indoor competition in the UK and feels that it may finally afford windsurfing the recognition it deserves. Other British sailors competing at the show include Nik Baker, John Hibbard, Chris Audsley, Ben Proffit, Shawna and Louise Emery. On the 18 January, there will be special UKWA versus PWA event featuring slalom, freestyle and jump finals, with £5,000 prize money and a Honda motorcycle up for grabs. Tickets for the individual sessions can be booked in advance by calling 0871 2228313, these range in price from £3 to £5. They can also be purchased on the day depending on availability. For more information and a timetable of the event go to www.londonboatshow.net. Sailpower will be following the competition as it unfolds culminating in the UKWA versus PWA comp on Sunday 18 January.